David Faber was only 13 years old when he promised his mother, who had just been shot and killed by the Nazis, that he would tell the world about what they had done. At age 85, a Polish Jew, Faber has spent the greater part of his lifetime giving lectures to audiences, such as the 2-hour one at the Mt. San Jacinto College held on Thursday, Oct. 13. 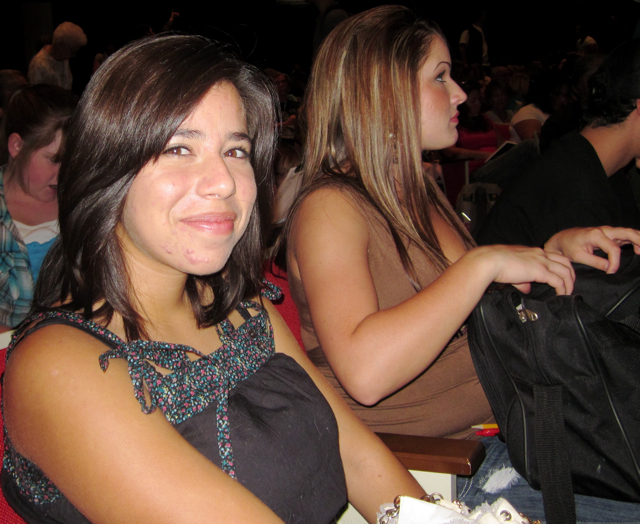 The event, sponsored by the Phi Theta Kappa, an academic honor society, was open to the public, although the audience was comprised mostly high school and college students. Some were getting extra credit for writing a report. Tickets were $5 each, and hours before, the show was sold out. Grace had already researched the Holocaust for a school project when she attended the Idyllwild School and got an “A.” And this past summer, the family had visited the Dachau concentration camp in Germany, where Grace had heard a lecture by another concentration camp survivor. Before the lecture when David Faber was signing books, Grace got her picture taken with him. 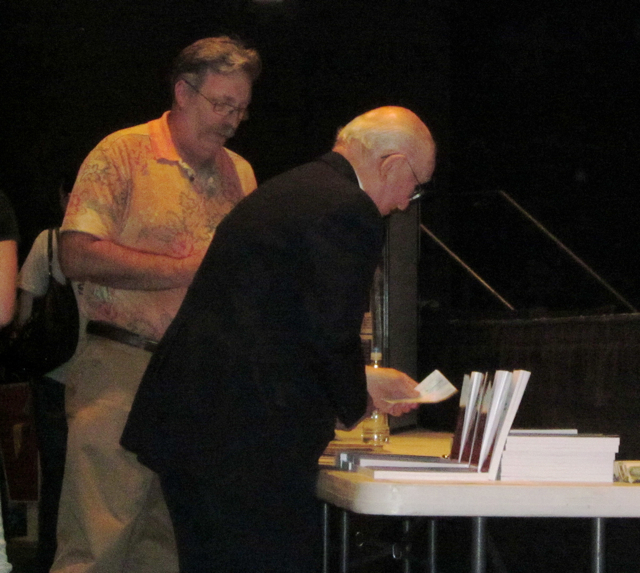 Faber offered the autographed books for $15 each. David Faber, an award-winning lecturer, signed copies of his recent book named after his brother, Romek. During the next two hours, David, with a single microphone, stood before a panel of family photos and news clippings, and recounted the atrocities that happened to him and his family during the weeks that followed the Nazi invasion of Poland. After that, David told of how he barely survived nine concentration camps. The family photos that Faber referred to came from his eldest sister who escaped to England before WWII began. Rachael Faber was a talented dress designer and was invited to show her work in Paris. When she got a VISA, she ran away and later lived in England. These photos David received from her husband after her death. In Katowice where the family lived, the Nazis forbade Jews to enter stores and banks following the Nazi invasion. So the family fled to a nearby town where they stayed with cousins. When they were murdered in their home, with David as a witness. When random shootings continued, David’s father found an abandoned warehouse where they slept on potato sacks filled with straw. They would have eventually been found by the Nazis had Romek, David’s brother, a soldier and ex-POW, had not found them. Romek banged on the warehouse walls and eventually found a crawl space where the family hid from the Nazi shootings. Yet, after days of no food and water, the family gave themselves up and registered at Nazi headquarters. Each received a stamp on their papers. “The letter ‘K’ in a circle means death,” warned Romek, whom they later found out was working for the British Intelligence. Since several of the family members had that stamp, Romek advised them to hide again, this time in an abandoned apartment building. He banged on the walls in one apartment and found another crawlspace where the family would hide when the Nazis would raid. Romek had hung pictures over the hole and decorated the area with more pictures and a small couch. One day, the Nazis came quietly. They shot David’s father first outside, and then his mother and five sisters near the crawl space. During the commotion, David had slid under the narrow couch. When the shooting was over, all of his family was dead. One of the Nazi’s jumped up and down with glee on the couch, unaware of that David was underneath it. “See? I told you that we would get them all if we came quietly,” the Nazi had said. “You speak perfect German. If you are caught, use it to impress them,” he said. David was sent by rail car to a concentration camp, where several men, women and children died along the way. His job there was to open the cans of poison that would later be used in the gas chambers. After they died, David had to gather up their possessions, including jewelry and gold fillings. One time, David noticed that a baby was still alive, still attached to his mother’s breast. He and another man tried to give the baby to women in the camp, but they were found out, and the man was tortured and killed. David was ordered to throw the baby into the oven. He asked the Nazi soldiers if it would be better to give the baby to some of the women instead. “Dare you defy my orders?” the soldier yelled and threw the baby into the oven himself. David later was beaten with a hose until he passed out. 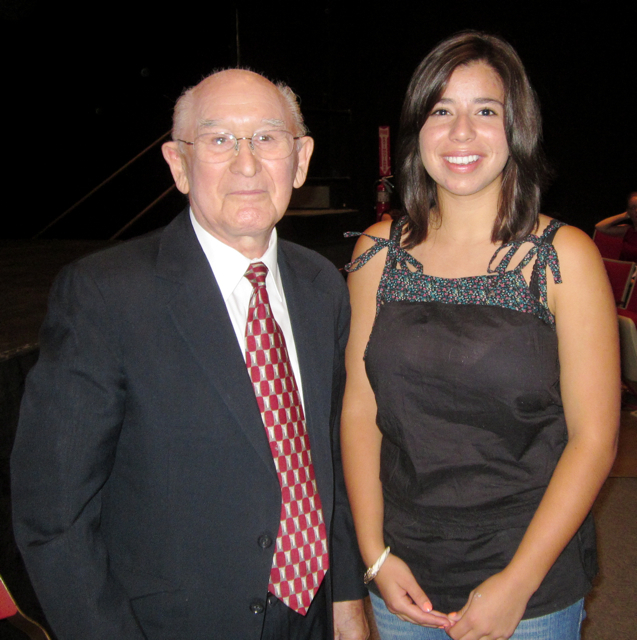 “How I survived nine concentration camps, I don’t know,” David said towards the end of his lecture. The last concentration camp he was at was called Bergen-Belson, made famous by Anne Frank. Two women from the British Red Cross were checking out those massive graves before burial, when they spotted David, moving among the dead bodies. “I was 18 years old, and only weighed 72 pounds,” David recalled. A picture of him at that time is shown in his book. It’s a haunting image that you will not soon forget. He survived typhoid and polio. In 1957, he immigrated to the U.S. and five years later, became an American citizen. Over the years, David was sick and in and out of American hospitals. Later on, Grace was appalled to hear that some people believe that the Holocaust never really happened. “How can they face a man like David Faber and say that?” she asked. Yet, even at a young age, Grace knew of the importance of attending Holocaust lectures and spreading the word so that it will never happen again. David Faber’s book, (1997), “Because of Romek: a Holocaust survivor’s memoir,” is produced by Granite Hills Press, and is available by Amazon and most major book retailers. As one of the sponsors of this weekend’s “Lemon Lily Festival,” Jeffrey Taylor, from Green Cafe/Cafe Cinema, will show a film this Friday that examines the ecology and biodiversity of the earth. Taylor chose an episode from the stunning 1984 BBC documentary, “The Living Earth,” in which David Attenborough predicts the fate of the world, if the current pace of industrialization continues. Before the film, Ina Lengyel, San Jacinto State Park Ranger Aide, (and wife of Richard, who retired from the post office), will give a brief presentation of our native wildflowers, including the Lemon Lily. Main sponsors of this weekend’s “Lemon Lily Festival” plan to plant Lemon Lillies along Strawberry Creek’s bed to help preserve them. Part of Friday’s film presentation and lecture will emphasize the importance of protecting the Lemon Lily’s habitat. Yesterday, Tucker McIntyre, head of Transportation at Idyllwild Arts, took a hike with his wife, Megan, up by the switchbacks, and found a single Lemon Lily growing by a creek bed. McIntyre took several pictures of it on his cell phone, but left the flower intact. “The Living Earth” documentary and Lengyel’s talk starts at 7:30 p.m. this Friday, July 16, at the Green Cafe office, located at 26364 Saunders Meadow Road (next to Mile High Cafe) in Idyllwild. Food, beverages and admission is free. For more information on Cafe Cinema’s weekly film series, visit www.cafecinema.org. 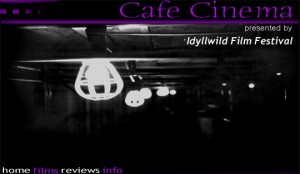 And for more information on the “Lemon Lily Festival,” held July 16-18 in Idyllwild, visit www.lemonlilyfestival.com.